Business growth presents special challenges in financial planning because executives often believe growth is something to be maximized. Unfortunately, fast-growing companies that lack the financial acumen to manage their growth can and do fail. Increased sales require more assets of all types (i.e., inventory, accounts receivable, productive capacity), which must be paid for. Retained profits and new borrowings generate some cash, but only limited amounts. Unless an owner is willing and able to sell equity or borrow money, the sustainable growth rate is a ceiling on the growth achievable without straining resources. As equity grows, a company can borrow more money without altering the capital structure. The sustainable growth rate then is nothing more than its growth rate in equity. Assets, liabilities and productive capacity will expand proportionally to sustain growth in sales up to $1,212,500. Any growth greater than 21.25% will begin to strain resources—debt capacity will be reached, lenders will refuse additional credit requests, and cash will be deficient to pay bills. 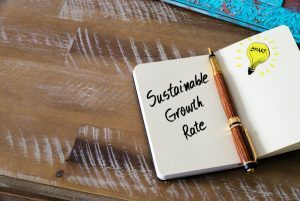 Calculate your sustainable growth rate and keep an eye on your numbers. You can have too much of a good thing, whether it’s turkey or sales.